Exuding elegance, this stunning women’s watch is brought to you by Guess Collection as part of their new Structura range. 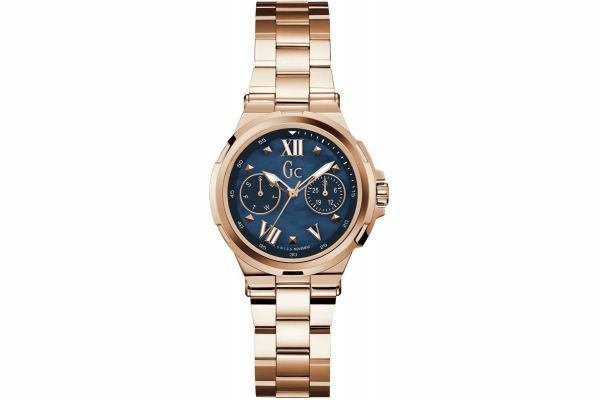 Featuring a beautiful 34.5mm polished rose gold plated stainless steel round case and bezel in which houses an alluring royal blue pearlescent dial. Two smaller sub-dials present both the day and the date and are exquisitely highlighted in rose gold. Minimal rose gold hour markers enhance the simplistic sophistication of this watch, whereas the three hand movement allows for easy reading at a glance. Set upon a stunning three link rose gold bracelet and fastened by a secure fold over with push deployment closure; the Structura watch by GC is both stylish and practical. Powered by a Swiss made Quartz movement and protected by mineral glass this watch is water resistant up to 100 meters and comes with a two year guarantee. For us to size your new GC Structura watch as accurately as possible, please take a look at our downloadable Watch Sizing Guide.